Torrent users have suffered a setback, as leading browsers Google Chrome and Firefox have blocked direct access to the popular torrent meta-search engine, Torrentz2.eu for reported ‘harmful programs’. 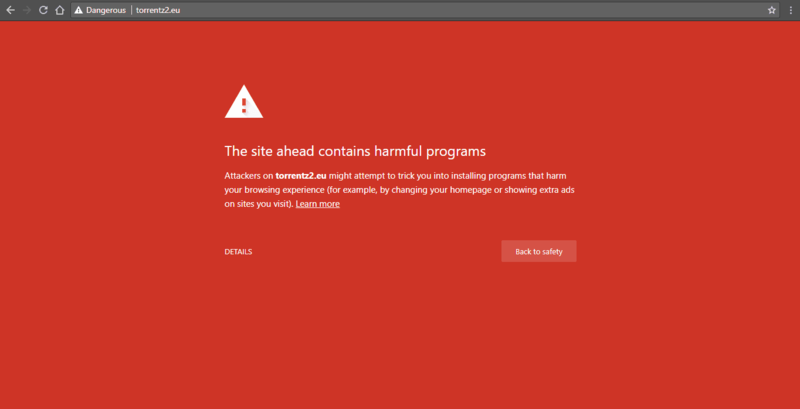 The past few hours, Chrome and Firefox users have been unable to access Torrentz2.eu, TorrentFreak reported on Thursday. These warning messages are generated by Google’s Safe Browsing algorithm which highlights websites that could cause potential danger to visitors. Chrome, Firefox, and others use this service to stop users from opening an unwanted software. These warnings are normally the result of malicious ads, which does not appear to be in this case. The Torrentz2 operator told TorrentFreak that he currently only promotes a VPN service, which is by no means malicious. However, Torrentz2 has been flagged for installing “unwanted or malicious software on visitors’ computers,” as per Google’s Safe Browsing report. Apparently, Google also flags “social engineering” attempts wherein false claims fool users to take a certain action, TorrentFreak had discovered from another site admin in the past. Torrentz2’s ad warned: “Your Internet Provider is tracking your torrent activity!” which theoretically could fit this category, as ISPs basically don’t keep a record of users’ torrenting habits. Currently, the torrentz2.eu website is down due to hosting issues, which the operator plans to fix soon. For those torrent users, who are unaffected by the warning messages by Chrome and Firefox, and wish to visit the affected sites by bypassing the blocks can do so at their risk by taking proper measures (Chrome, FF).